Add a unique touch to your living room with a contemporary leather ottoman. This handcrafted furniture is made of 100-percent genuine leather in Marrakech, Morocco. Within the city's medina (center of town), there is a souk (market) where most of the artisans work. This is also the center of trade for each city. Artisans who create Moroccan leather goods are predominantly male. Leather goods are made from lambskin. Artisans live in small villas made of concrete, which is a building material that is plentiful in Morocco and also insulates the residents from the extremely high summer temperatures and intense sun. This is my first pouf. It was exactly what I was looking for. It serves as an ottoman and an extra seat when I have company. This particular one comes stuffed because I didn't want to have to "deal" with that. This is an extremely good value for the quality - the price is almost the same if you purchased an unstuffed one. The color is even and fully saturated. The leather is supple and decorative stitching is excellent. It is not squishy so you don't have to worry about it going flat or becoming uneven. I LOVE this pouf. It is exactly what I had in mind. The color is amazing, I am considering ordering another one in a different color. It is very unique and gives my living room just the vibe I was going for. I ordered the tangerine, and it's fabulous. My only issue with this product desciption is I would love to see more detailed pictures of the pouf in an actual room. The pictures did not do the product justice, but I am happy it worked out. 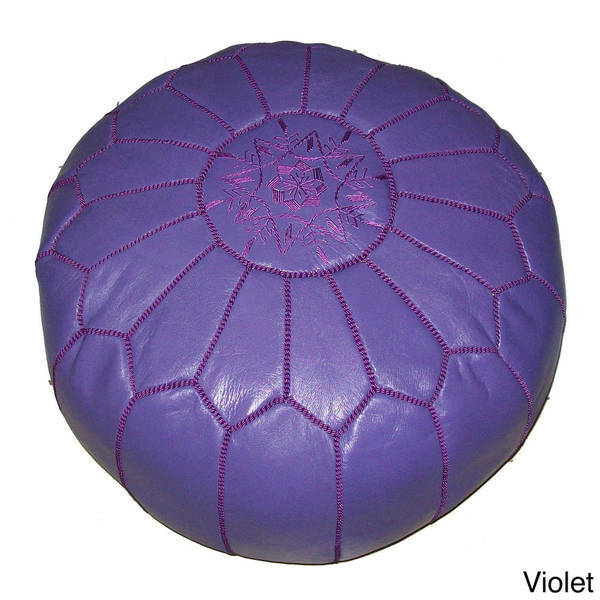 I would recommend the pouf. I would NOT recommend the aqua pouf, which is not at all aqua and would be more accurately described as royal blue. Royal blue is quite different from aqua. Description of this product needs to be changed, as does the picture. The pouf I received is not at all the color I thought I had purchased. I have to agree with the previous review regarding the color description and photo. I ordered Violet and it is closer to Lilac. It's not a deep purple at all. Otherwise, I am pleased with the quality and the size is perfect for my cute little Ravens Den. I did check "yes" on recommend to a friend, however they should be prepared for an off color. It does not look as pictured. I bought two of them and I love them. I would like to get more. The only downside is that they compress a lot, but they are still really comfortable and I am very happy with them. It is nice and arrived in 24 hours - or so it seemed! "Do you have an accurate picture of the violet ottoman? One review states, "I ordered Violet and it is closer to Lilac. It's not a deep purple at all" I am actually looking for a color that is in b/t the pictured violet and the pictures lilac...so if you have an accurate representation that would be great!" Hello stella1202, we try to represent the colors of our products accurately. Unfortunately, due to the difference in monitor colors we cannot guarantee that the color will match exactly what you see on your screen. Thank you for shopping with us. "Does this ottoman come stuffed?" Hello helaine7, Yes this Moroccan Contemporary Leather Ottoman (Morocco) does come filled. Thanks for shopping with us. "Is the aqua truly aqua? A 2013 review says it was actually a royal blue in person. Has this been changed?" Hello kmarie923, I was able to look at reviews on other sites and I think that customer may have received the wrong color. Other customers have said that the aqua is more green than aqua color. Have a great day! "can you please specify which of the purple poufs is lilac and which is violet?" Thank you for your inquiry regarding the Moroccan Contemporary Leather Ottoman. The one on the left side is the violet, and the one on the right, next to the tangerine one is the lilac. I hope this answer helps you. "How sturdy is this product and are there weight requirements known or has this been tested?" This item comes filled with natural green fiber (heavy duty), is 100% leather, and is handmade by a master artisans. It should hold up very well for different uses. It has not been tested regarding weight limitations.